Update: You can find the latest version here. I own a Navigr Bike GPS (with a model descriptor of ‘NAVBIKE-GPS’). My primary use for it is recording tracks for OpenStreetMap, and it works well enough for my needs: small, fairly accurate, decent battery when recording and a seemingly infinite battery when left in a drawer and forgotten about. 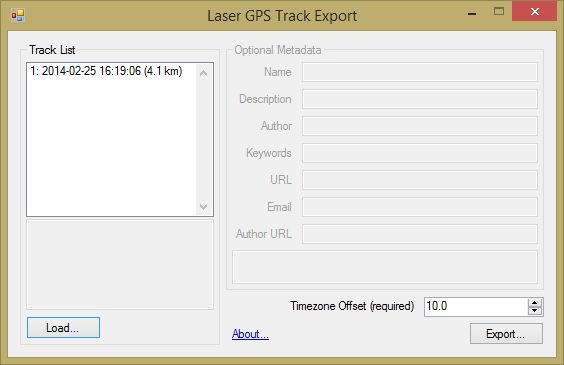 It has two problems: first, it doesn’t record altitude on the GPS tracks, which isn’t a big deal for me, and second, you can’t directly save tracks from the “Laser GPS” program bundled with it. Writing a wholesale replacement or driver seemed overkill, since the software could already access and save the gps tracks on my computer – just not in a useable format. A bit of hunting with Process Monitor and some peeking inside files found them in a file called ‘BridgeMin.dll’ in the install directory. I still don’t know what the name refers to, but it’s actually a password-protected Jet database, which would easily be opened by Access if I knew the password. Which turned out to be trivial. The password is “danger”. There are four more trackpoint tables – TrackPoint2, TrackPoint21, TrackPoint211, and TrackPoint3 – but they’re all empty for me, and seem to contain various combinations of the columns in the first two tables. Cari, which increases along the track, but not at an obvious rate – possibly “calories”? The waypoint IDs increase sequentially in the order they were recorded, fortunately, so there’s no need to get too fancy with retrieving them. The last of these, TrackDist, could at least be easily figured out, and at least for that column the units used are centimetres. Once I got it working and exporting valid files, I lost interest in adding the other planned features, like the optional metadata, or displaying more details about the selected track below the listbox to make them easier to differentiate (e.g. many short tracks on the same day). Even that ‘About…’ link doesn’t do anything. This entry was posted in Uncategorized on March 6, 2014 by bdhurkett.